This flag was adopted on 16 September 1988. It is red, white and three different shades of blue. 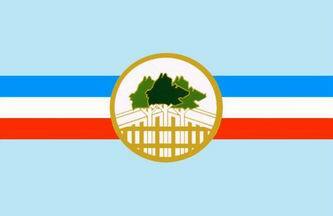 The mountain is in the canton as in the 1963 flag, but now in dark blue on a light blue background. The field is medium blue over white over red. The mountain on the flag (and coat-of-arms) is Mount Kinabalu (4101 m). The state Flag is in a rectangular shape and is in the proportion of 1:2. The canton which extends at the head half way to the fly and 2/3 at the hoist to the foot is in Icicle Blue (CIT9) as the background to a graphic silhouette of Mount Kinabalu which is in Royal Blue (B10) positioned at 1/4 of the height of the canton from end to end). The fly of the flag is divided equally into three bands of colours the foot division of which extends right to the hoist. The top band is in Zircon Blue (C5T5) the second band is in white and the third band is in Chili Red (S6R4). In this flag, Zircon Blue symbolises peace and tranquility, White symbolizes purity and justice, Chili Red symbolizes courage and conviction, Icicle Blue symbolises unity and prosperity and Royal Blue symbolizes strength and co-operation. The image at the InfoSabah Website shows the form of Mt. Kinabalu as a table mountain (slanting), which agrees with the image in Znamierowski 1999. Confirmed from Album des Pavillons 1990 and Dorling-Kindersley 1997. The latter has all the blue shades much darker than in Album des Pavillons 1990 and the image found by Jarig Bakker in the InfoSabah Website. The colors on the image above are accurate as per how manufacturers are making up Sabah's flag. I'm guessing that this must be the most challenging of all Malaysian state flags to make. I say that because I have yet to see a really nice sample of this flag either printed or fully sewn in "proper" bunting. On August 31st 1963 Sabah adopted a four striped flag, red over white over yellow over blue, and a green canton with a brown mountain. In Vexilla Nostra no. 166 I found that in between the 1963 flag and the 1988 (current) flag another flag was used, adopted January 1st 1982. It was a completely different design: blue over white with a red triangle on the hoist. It looked very much like the flag used by Sarawak (the other Malaysian state on Borneo) until August 31st 1988, which was red over white with a blue triangle on the hoist. From 1982-88, the coat of arms of Sabah was a kingfisher. During that period the Sabah state government chose to adopt a state coat of arms that resembled Sarawak's hornbill, in memory of the two Borneo states' common history as vassal states of Brunei in the pre-British times. Sabah adopted a kingfisher because its indigenous Bajau sea gypsies, who are politically powerful in the state administration, and another powerful indigenous group, the Bruneians from Brunei, identify with the bird to a great extent. Both Bajaus and Bruneians were traditionally fishermen, and amongst Borneo natives, birds are considered messengers of the gods. The omen bird for the fishermen is the kingfisher. The majority native tribe, the interior-dwelling Kadazans or Dusuns, identify with the kingfisher to a lesser extent, as the bird is commonly found amongst their main occupational group, the rice farmers. Sabah from 1982-88 also made its flag resemble Sarawak's. The common design of the flags of Sabah and Sarawak then was that of Czechoslovakia. The intention of the Sabah and Sarawak leaders of that time was to rekindle blood ties with the Indonesians and Filipinos who also share the island of Borneo (in the case of Indonesia) and who have a common history with the island's peoples (in the case of the Philippines). In 1988, both Sarawak and Sabah changed their flags to more individual designs. Sarawak readopted the colours of red, black and yellow, the traditional colours of the Brunei sultanate which ruled Sarawak. Sabah changed its flag and crest. The flag and crest of Sabah were changed to resemble the original flag and crest used when Sabah joined Malaysia in 1963. The 1982-88 flag and crest were considered rather radical for their time. Sabahans and Sarawakians have strong feelings of separateness, and Sarawak natives are not welcome as Sabahans, even though Sarawak and Sabah do have common tribes, such as the Bruneians and the Kadazans/Dusuns. The 1963-82 flag and crest were ditched in 1982 because they were blatantly copied from the political colours of the first ruling party of Sabah, the United Sabah National Organisation (USNO), which has since 1991, been dissolved and turned into Sabah's branch of the national-level ruling party UMNO (United Malay National Organisation). Nevertheless, Sabahans agreed to modify the colours of the original flag and crest when they readopted the 1963-82 designs of the flag and crest in 1988. The colours of the 1982-88 flag are used in the 1988 flag and crest. The Kadazans/Dusuns were especially angry with the 1982-88 flag and crest because they omitted Mount Kinabalu, their holy mountain and abode of ancestral spirits. In Kota Kinabalu last week, while at the water front, I happened upon a Sabah blue ensign. I saw several although I was not in a position to photograph them. The Sabah Port Authority is the entity responsible for Sabah's ports. Sabah has a sort of quasi-independent status within Malaysia...one I don't fully don't understand...but with its status is an apparent right to provisionally fly the Sabah blue ensign on the high seas and in local waters. The Sabah Marine also uses the same ensign. They are a sort of customs/law enforcement agency responsible for thwarting piracy in and around Sabah. I say "provisionally" as I saw all of the other common Malaysian ensigns flying as well, those being the Malaysian red ensign, the white ensign, and maritime enforcement ensign. "The Sabah Forestry Department Flag consists of 2 components: the Forestry Department logo and the colours of the Sabah state flag as background. The combination represents the Department's commitment in an ever progressive and prosperous Sabah." Vertical red-white-green tricolour with the museum logo in the white stripe. The words on the logo are JABATAN MUZIUM SABAH. "It should be noted that a special usage exists in Sabah on local vessels, perhaps as a holdover of traditions of the colonial era. Instead of the Malaysian civil ensign, those ships fly a local version having a red field and the state flag as a canton in the upper hoist corner. Both the new flag and the 1963-1981 versions have been displayed in this fashion." Thre "new flag" referred to here is the 1981-1988 version. There must have existed three civil ensigns then: 1963-1981, 1981-1988, 1988-present.